The Futurists rejected the style and painting conventions of the past, saying, “to admire an old picture is to pour our sentiment into a funeral urn instead of hurling it forth in violent gushes of action and productiveness.” They found form and color subjective and focused on communicating speed, technology, and violence. They were quick to point out their youth and projected they would only be useful as Futurists until the age of 40. 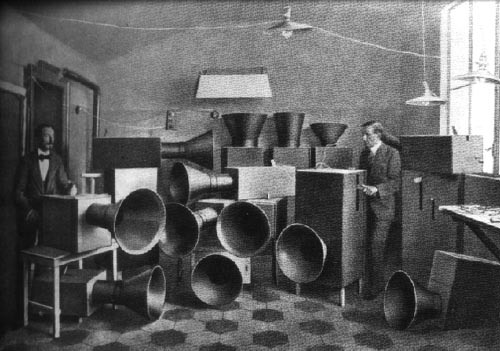 Luigi Russolo, primarily involved in the Futurist ideas of noise, holds his spot in history as the creator of the Intonarumori, or “noise machines.” His interest in noise is clear, even in his early days in Futurism. He began as a painter – “Music,” displays his interest in combining multiple senses and in a sort of cross-portrayal of sound through sight. The Futurists claimed “we do not draw sounds, but their vibrating intervals.” Sound vibrations are suggested in this work through the ripplings of rings originating from the musician. The figure playing music on a keyboard has five hands, communicating the rapidity of his musical performance. Both the music emanating from the figure and his hands are examples of this repetition suggesting movement and change, whether sound waves or action. Futurist paintings often portrayed action through the multiplication of form, as in the dog’s legs in the always delightful “Dynamism of a Dog on a Leash.” This technique of showing motion is natural to the modern viewer, but was new in the early 20th century and comes from a little invention called “photography,” which allowed for the study and capturing of motion in a completely new way. The Futurists wanted to show art as one experienced it, not as it was. “The construction of pictures has hitherto been foolishly traditional. Painters have shown us the objects and the people placed before us.” Color, line quality, and form were meant to appeal to the emotional experience of the viewer. 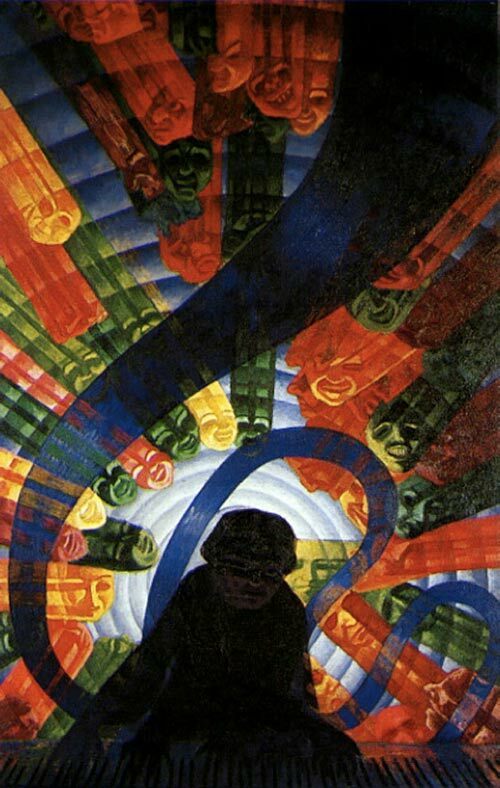 “Music” accurately displays the Futurism in all its movement and repetition, attention to sound, and use of color as an experience rather than true to life. 02 Jul	This entry was published on July 2, 2012 at 2:23 pm. 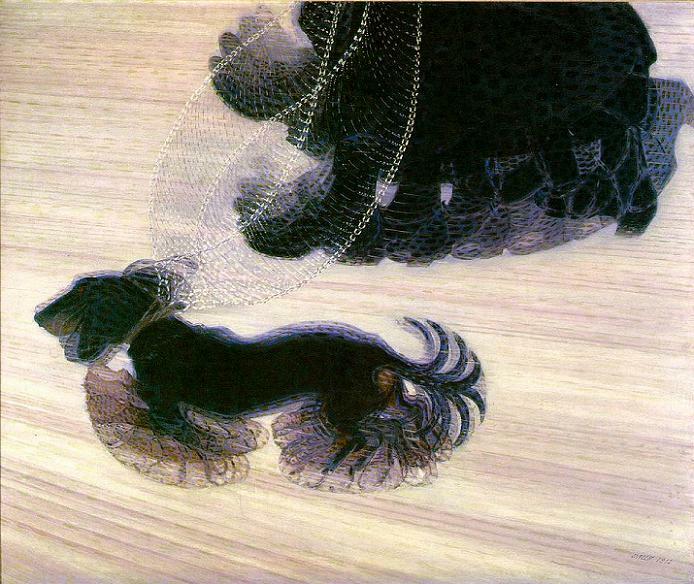 It’s filed under Art, Art History and tagged Dynamism of a Dog on a Leash, emotion, Futurism, Giacomo Balla, Luigi Russolo, motion, movement, music, noise, noise machines, Russolo, sound, speed, technology, violence. Bookmark the permalink. Follow any comments here with the RSS feed for this post. Great post – one of the best description/ summary of Futurism that I’ve read to date 🙂 I am however, struggling to see the five hands. Love this line: The Futurists wanted to show art as one experienced it, not as it was. Look forward to exploring your blog more. Thank you! I just messed with the contrast of his hands on Photoshop to show you better, but apparently it isn’t possible to post that in a comment. The two hands on the left are fairly visible, as well as the far right hand, but the two between are quite shadowy. But distinguishing each isn’t really the point, as long as you get the impression of movement. Thanks for trying! I can definitely see it better now with the description. May even try and look for a copy of it in a book! That’s true the impression of movement is definitely there and well captured!